On November 27, 2006, Save Mart announced an agreement to acquire 132 Albertsons stores in California and Nevada. Save Mart officially began operating the stores in late February 2007, and the acquired stores were to be re-branded during the year. Those in the San Francisco Bay Area were to be rebranded Lucky, and the rest would operate under the Save Mart banner. This Pacific Grove, California supermarket was one of several former Albertsons stores acquired by Save Mart in 2007. 1952 – First Save Mart store opens in Modesto, California. 1973 – Yosemite Wholesale opens in Merced. 1981 – Bob Piccinini is named president. 1984 – Save Mart partners with two other retailers to launch Mid-Valley Dairy, producer of Sunnyside Farms products. SMART Refrigerated Transport opens in Turlock, California. 1985 – Bob Piccinini purchases Save Mart Supermarkets and becomes CEO. 1986 – Opens its first two Food Maxx stores in Bakersfield, California in partnership with the Fleming Company. 1988 – Partners with two other retailers to open Sunnyside Farms Dairy product plant in Turlock. 1989 – Acquires 27 Fry’s Supermarkets in the San Francisco Bay Area. 1991 – Helps found and becomes a voting partner in Super Store Industries (SSI). 1997 – Acquires 10 Lucky stores in California. 2003 – Acquires 25 Food 4 Less stores and rebrands them FoodMaxx. 2007 – Acquires Albertsons stores in the Sacramento, California area, San Francisco Bay Area, Central Valley and northern Nevada and converts them to Lucky and Save Mart stores. Checkout lanes inside a Save Mart (formerly an Albertsons) supermarket in Pacific Grove, California. Save Mart Supermarkets includes a number of store banners and private label product brands. Save Mart stores are full-service grocery stores with a broad product offering, including fresh products, bakery goods, deli foods and ethnic foods. Lucky Supermarkets are full-service grocery stores. Their offerings include fresh products, bakery and deli-prepared foods, and ethnic offerings. FoodMaxx is a warehouse-concept grocery store. MaxxValue Foods offers products at warehouse-store prices without a store club membership fee. Super Store Industries (Lathrop) also produces and packages bottled beverages, cultured dairy products, and frozen dairy products for several brands, including Sunnyside Farms yogurt, Stater Brothers ice cream, and Minute Maid orange juice. SSI owns and operates Sunnyside Farms (Fairfield) and Sunnyside Farms Dairy (Turlock). Yosemite Wholesale (Merced) is a dry and packaged good warehouse servicing all of the company’s stores. Save Mart Supermarkets Distribution Center (Roseville service all of the company’s stores. SMART Refrigerated Transport (Lathrop) is a trucking firm that transports dry groceries, frozen foods, ice, and novelties to all of Save Mart Supermarkets’ stores. The company also works as an outside contractor hauling products for other retailers. In November 2011, hundreds of Lucky customers throughout the San Francisco Bay Area were reported to be victims of card-swipe thefts the previous month. 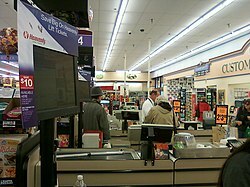 The crime resulted from the surreptitious placement of card-scanning modules at the stores' self-serve checkout stands. Card information of customers, including personal identification numbers (PIN) may have been retrieved by the criminals. Some customers reported having money withdrawn from their accounts. The company advised affected customers to contact their financial institutions. Lucky also advised some customers to close their accounts. Since 2010 the company closed stores in Clovis, Delano, Elk Grove, Folsom, Fresno, Kerman, Merced, Milpitas, Modesto, Sanger, San Pablo, Tracy and Yuba City, due to competition, higher prices and other reasons. In a 2013 settlement with 35 California district attorneys, the company agreed to pay $2.55 million in civil penalties, costs and expenses for violating state law on storage, handling and disposal of hazardous materials, including items like bleaches, batteries, electronic devices, ignitible liquids, aeresol products and cleaning products. In 2015 the company agreed to pay $277,319 in back pay and damages to distribution center workers in Vacaville (now closed) and Roseville. A U.S. Department of Labor investigation found the company failed to include bonuses in the employee rate of pay when computing overtime. Employees at the company's stores are represented by labor unions. These include: United Food and Commercial Workers, Teamsters, Service Employees International Union and Machinist Automotive Trades District. ^ "Save Mart Supermarkets on the Forbes America's Largest Private Companies List". Forbes.com. Retrieved 2015-04-28. ^ "#91 Save Mart Supermarkets". ^ Save Mart Supermarkets confirms sale of Albertson's Northern California division (PDF) Archived July 3, 2008, at the Wayback Machine, Save Mart Supermarkets, February 23, 2007. ^ Calderon, Victor (2007-07-09). "Save Mart in, Albertsons out". The Salinas Californian. p. 1. Retrieved 2011-04-30. ^ "Hey Moo!". Super Store Industries. Retrieved 30 November 2011. ^ Vivian Ho (December 9, 2011). "500-plus victims of card-swipe scam at Lucky". The San Francisco Chronicle. Retrieved 21 December 2011. ^ "Save Mart Closing Two Stores | Retail & Financial content from". Supermarket News. 2010-09-28. Retrieved 2015-04-28. ^ "Local News". FresnoBee.com. Retrieved 2015-04-28. ^ MIKE NORTH - mnorth@mercedsunstar.com. "Save Mart closing two Merced stores | The Merced Sun-Star The Merced Sun-Star". Mercedsunstar.com. Retrieved 2015-04-28. ^ "Save-Mart To Close Store In Elk Grove « CBS Sacramento". Sacramento.cbslocal.com. 2012-06-01. Retrieved 2015-04-28. ^ Bowers, Wes. "Milpitas Save Mart to close – San Jose Mercury News". Mercurynews.com. Archived from the original on 2016-01-18. Retrieved 2015-04-28. ^ Stapley, Garth. "Save Mart to close grocery store in downtown Modesto | The Modesto Bee The Modesto Bee". Modbee.com. Retrieved 2015-04-28. ^ Gene Garaygordobil, Maria Ahumada-Garaygordobil. "Delano Save Mart sells to competitor, closing later this month". Delanonow.com. Archived from the original on 2016-01-18. Retrieved 2015-04-28. ^ Eric Vodden/Appeal-Democrat. "Yuba City's Save Mart will close in March – Appeal-Democrat: News". Appeal-Democrat. Retrieved 2015-04-28. ^ "Local News". FresnoBee.com. Archived from the original on 2014-08-01. Retrieved 2015-04-28. ^ April 28, 2015. "Biz Buzz: FoodMaxx to replace 11th Street Save Mart – Golden State Newspapers: Tracy Press News". Golden State Newspapers. Retrieved 2015-04-28. ^ "Save Mart Supermarkets closing grocery store in Folsom – Sacramento Business Journal". Bizjournals.com. 2015-04-22. Retrieved 2015-04-28. ^ April 28, 2015. 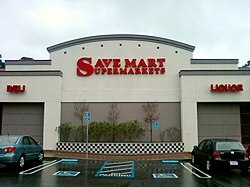 "$2.6 million settlement in Save Mart lawsuit – Lodinews.com: Business". Lodinews.com. Retrieved 2015-04-28. ^ "Save Mart to pay $2.5M from hazardous waste suit". Thebusinessjournal.com. Retrieved 2015-04-28. ^ "Save Mart to pay thousands in back pay, damages to distribution center workers in Vacaville, Roseville". Thereporter.com. Retrieved 2015-04-28. ^ "Central Valley Business Times". Central Valley Business Times. 2015-04-13. Retrieved 2015-04-28. Wikimedia Commons has media related to Save Mart Supermarkets. This page was last edited on 6 March 2019, at 08:23 (UTC).